A Person NOT a Label! During my oh so long college years when I FINALLY started in on the good stuff, that is my major, Special Ed., we often heard the phrase, “people first language”. I even had a professor that you would get a thorough tongue lashing if you did not use it. Now let me be honest, I don’t always walk on the politically correct side of the issues. Some of it is just plain ridiculous but I wholeheartedly agree on this issue in special education. So, let’s just get down to it. I HATE the word ‘autistic’ or ‘disabled’. If you use those words around me you will see me cringe or step back a bit even if I am trying not to do it. Here is the thing. A person HAS autism. They are NOT autism. There is more to people then their disability. When you call someone disabled or autistic they become that label. It is hard to see past the label and to the person. I am not talking about using the r-word in this post. Trust me, that deserves its own entry and I will get to that. I make an exception when I am talking to parents of children with a disability or a person with a disability. I consider it their choice on how they want to refer to themselves or their children. I feel like they are the experts in this area, not me. So, here is the question. If you are a parent or a person with a disability, what do you feel about people first language? Do you use it? Would you be offended if someone corrected you? 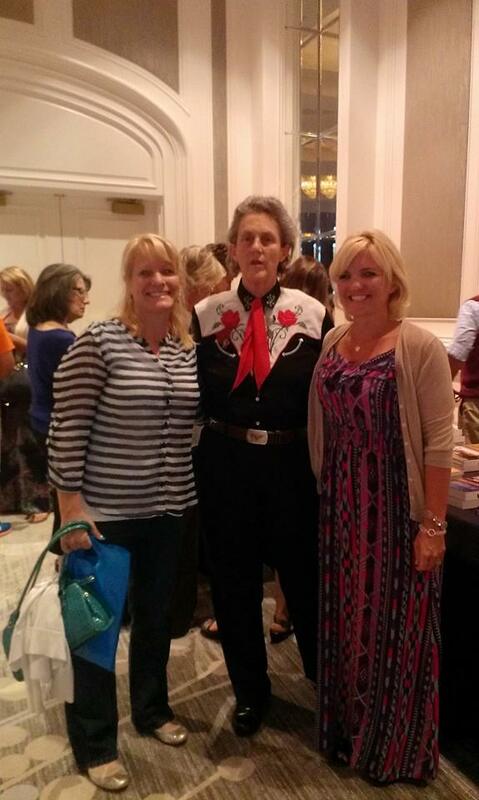 Last Fall I was privileged to attend a conference where Temple Grandin was the speaker. I even had the honor of meeting her and having her autograph some books. I LOVE Temple Grandin. She is brilliant and surprisingly, very funny! She has contributed so much to the field of autism. She has shone valuable light on an area that had seemed foreign not so long ago. Temple Grandin uses the word autistic all the time. I am not about to be the one to correct her. I think she can decide how she refers to herself and the autism community in general! ← Variety is the Spice of Life! Give this a read. 🙂 Thanks for writing! Thanks for the link. That was an interesting article. I understand the points made in it. I don’t think using people first language diminishes the identity of that person. I think that whatever the disability it is very much a part of who they are and a person’s identity. However, by using people first language it helps others to try to see the whole person and not just as the “disabled” or “autistic” person. It does not mean we are saying there is any shame in having one. I do agree that families and individuals with the disability should make the choice on how it is addressed and we should respect that. I like in the article that it states most people use the person’s name anyway. That was spot on. Thanks for sharing. I hope to hear from you again. I don’t think we can judge if it’s diminishing or not…especially if a community of people is asking to be called something BECAUSE they believe the other way to be diminishing. It’s important to take the aspect Of the autistic or disabled person into account. We are talking about them…. And they can hear us. It’s not for us to judge what feels diminishing or doesn’t. Especially since these people are saying that person first language feels diminishing. It’s important to take into account what the person wants and not what WE think is right. its so important we take the individuals needs and wants into account. It’s not what makes us feel comfortable. I remember mentioning this to my 12 year old son who has Autism, to which he replied ” I have Autism and I say I’m Autistic. If I don’t care why do people that don’t have it make the decisions about what it” I have to agree on both sides. I don’t generally introduce people or students as “this is my Autistic student, or this is my Downs Syndrome student, or this is my Intellectually Disabled neighbor. They all sound ridiculous. I just use their name and leave the rest to HIPA. Just like my husband doesn’t refer to me as his liberal, brown haired, far sighted wife. Sure they describe aspects of me but it would not be all inclusive of who I am. It all comes down to the fact that it’s really about the person you are addressing, you will always offend someone because we all have different ideas about what is correct. Besides, someone will change it in 5 years again, write a book about it, makes a ton of money, etc, etc, etc! Thanks for sharing Sarah. I think what I am learning from these comments is that it just depends on the person and what he or she prefers. I think the sad thing about labels is so many times they get negative connotations attached to them like so many other terms. Trust Me. It’s NOT for the Paycheck! specialedgeek on A Person NOT a Label! Sarah on A Person NOT a Label! shannmack on A Person NOT a Label!